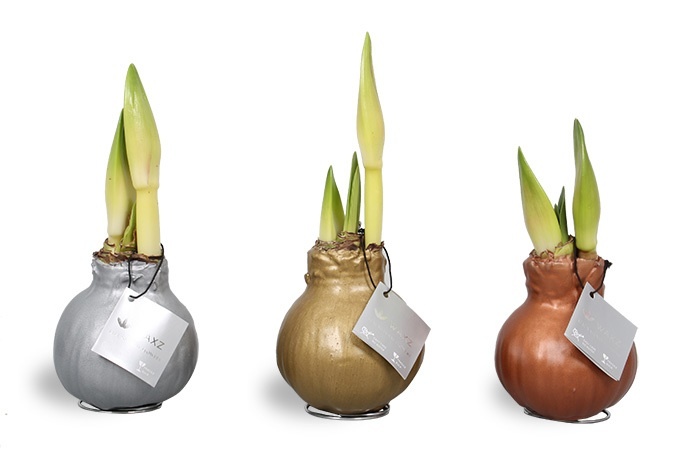 A Dutch grower, Vreugdenhill Bulbs, has an exciting new series of waxed bulbs that require no water, no soil and are guaranteed to bloom in 3-6 weeks! They are marketed by the fun name WAXZ. These carefree and modern bulbs come with a special metal spiral stand embedded in the wax layer to make them stand upright. This makes them versatile and they can literally be plopped down anywhere and left to bloom without any attention! They don’t require sun, soil or water. 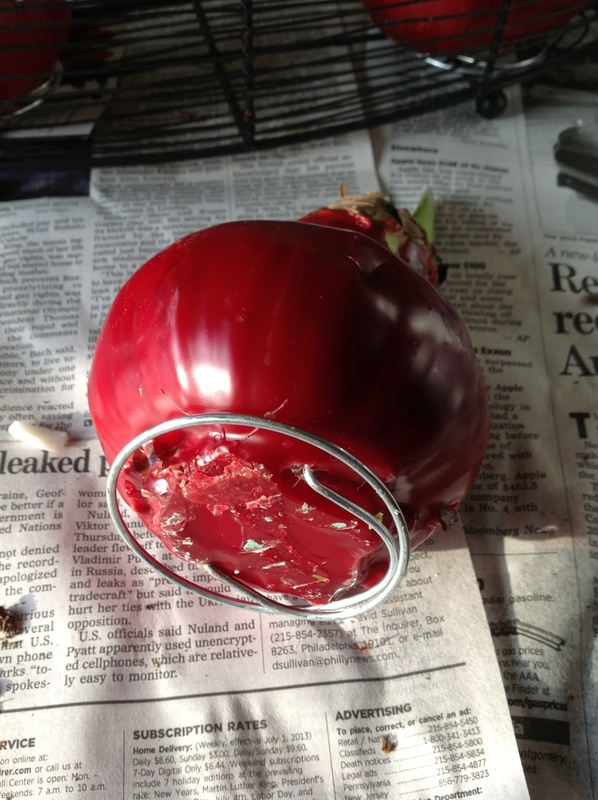 The bulb has been grown to have all the nutrition it requires stored in the bulb. The roots get cut short before the bulb is dipped in the decorative wax. These bulbs are intended for a single bloom season. The wax layer comes in a variety of colors and finishes which makes them a creative design option. They can be marbled, metallic,in a multitude of fun colors and even velvet-coated! 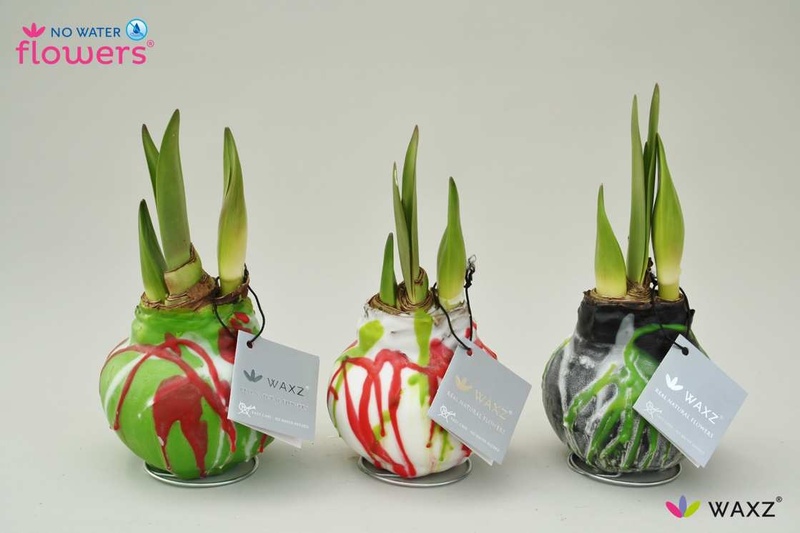 The wax finish is applied by hand to specially selected bulbs which have been grown to have enough energy stored so the flower will grow without conventional feeding provided by water and soil. The possibility of use are endless and they are adaptable to design ideas that could never have been considered before. I found plain red ones recently at my local Produce Junction, 3 bulbs, each in its own container, for an incredible $5! For a fun Valentine’s Day gift, I surrounded a trio of bulbs in Dove Dark chocolate nuggets. You could gift them this way at Easter too with seasonal candy. To demonstrate their versatility, I set a trio in an open metal basket surrounded with river rock. Modern, funky, easy and beautiful! 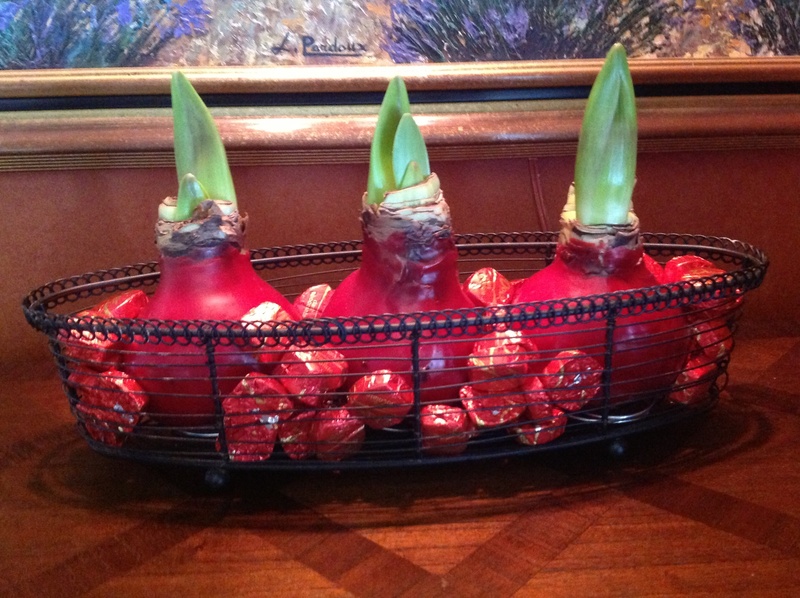 For now only amaryllis bulbs are being sold in wax. 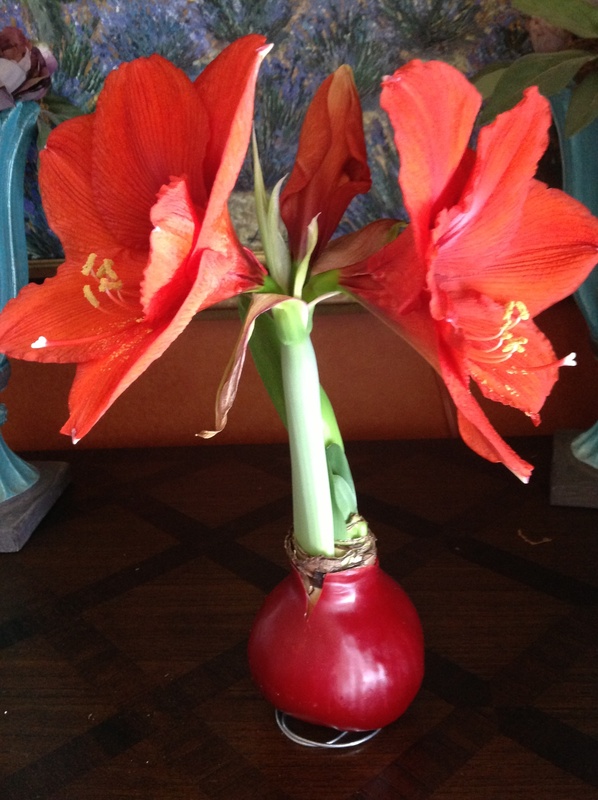 Update(March 3, 2014): In exactly 3 weeks, the bulb bloomed, as promised, and is gorgeous! Stems are a bit shorter and don’t require staking, another bonus. FYI: I found Wegman’s Supermarkets was selling these bulbs in November 2014 in the floral department for about $18 each. They sell out quickly so when you find them, stock up. I have been asked if these bulbs can be grown in subsequent years. Gardening friends have taken the wax off them and planted them the way regular amaryllis bulbs are forced in subsequent seasons and have had success. You have nothing to lose in trying. 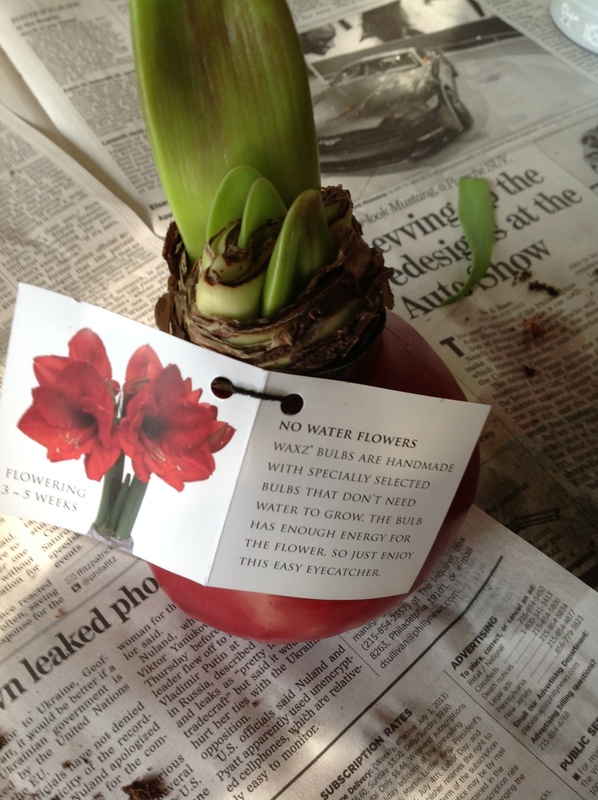 In the Northeast, I removed the wax and let the bulb go dormant as one would do with regular amaryllis then set it in soil in a sunny location with regular watering. So far, foliage only, no flowers. Both then, I often have this same problem with my other amaryllis! Trader Joe’s started selling the bulbs. They told me they import them from Holland bare and have them dipped in wax in Virginia. Again, they sold out quickly and none could be found after the first week in December. 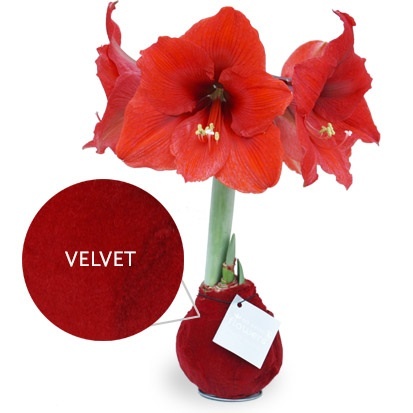 Some online sites were offering wax amaryllis for sale: Terrain(no metal spiral on these but at a lower price $16.95), Jackson and Perkins at various price points and finishes, boxed for gifting and also sold in multiples, Gardeners.com($29.95). Like in stores, the wax bulbs sell out quickly online as well. My impression is that these bulbs may be high maintenance for sellers as they are dipped in wax in the US and need to be sold quickly as they are grown to bloom in 3-4 weeks. This would perhaps explain why only limited quantities are available. 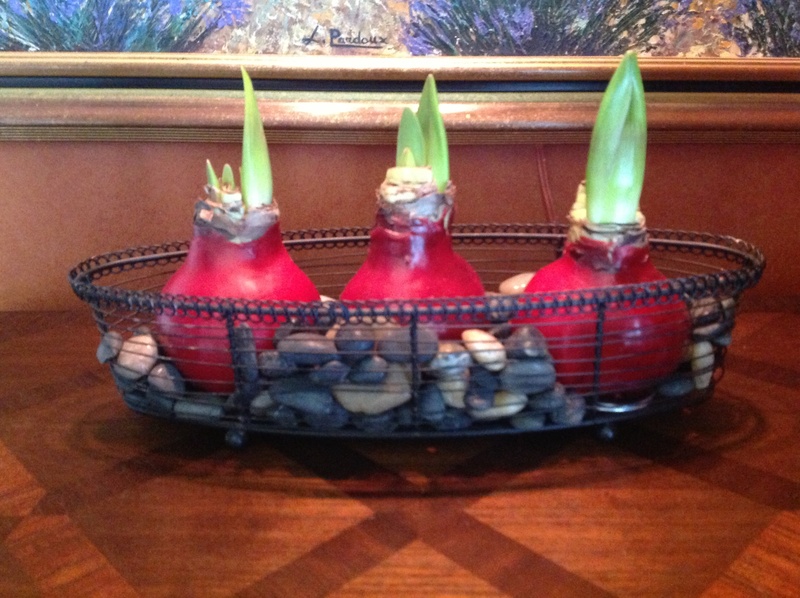 This entry was posted in Gardening and tagged amaryllis bulbs, creative gardening, Dove chocolate, Indoor gardening, No water flowers, No watering needed gardening, wax covered amaryllis bulbs, waxz bulbs by Johanne Lamarche. Bookmark the permalink. Johanne I wish you many more million followers. These posts are sooooo good. Your variety of information is amazing. I did have those bulbs at one time when Yigs brought them in their store but Yigs did not provide a picture of how to display them with such beauty. Millie, you continue to win the Best Fan Award! All I can find about these bulbs seems to be in trade publications so I’m super impressed they got these in Timmins! One reader asked if they were available in Canada and I could not find a source selling them. Thanks for reading and taking the time to comment thoughtfully. Love you! Where do you buy those wonderful plant bulbs ? Hello, we are the producer of the No Water Flowers®. Thank you for all the positive reactions. 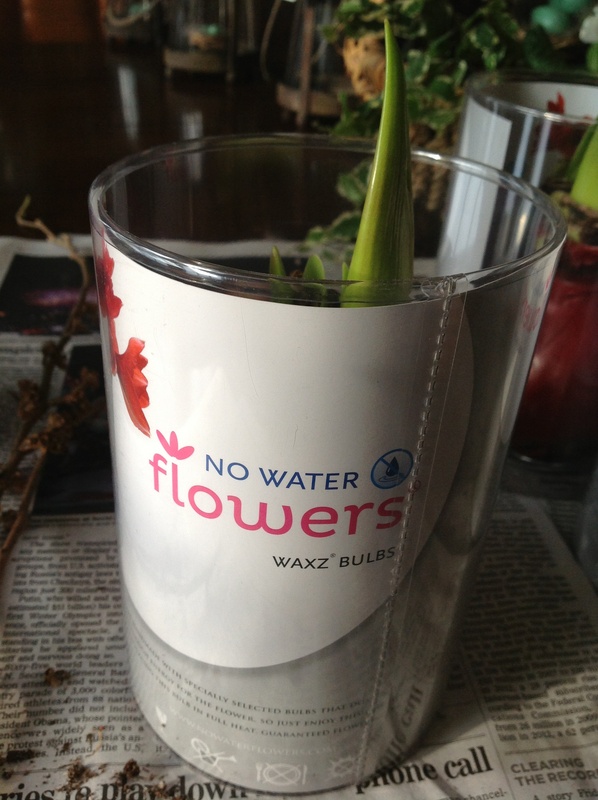 We’ve got a lot of request for our No Water Flowers®. Because we don’t have a steady reseller yet we will send our products directly from Holland. Please contact us for more information. can these waxed bulbs be grown in soil outdoors??? Hi Dana, it is my understanding that these bulbs have been grown specifically for use without soil. You could being them outdoors but without soil. I would not place them in full sun as they can’t be watered and you wouldn’t want to dehydrate them. 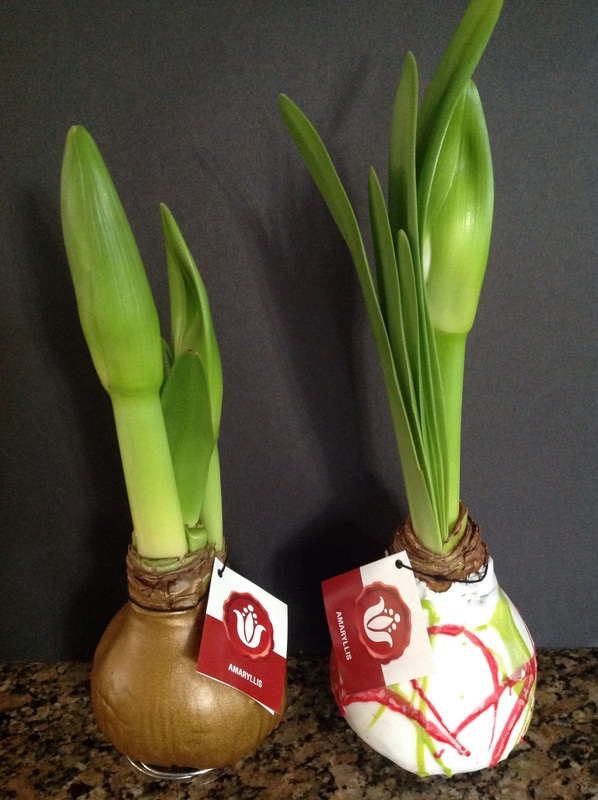 They are more expensive than regular amaryllis bulbs so I would get regular bulbs for planting in soil. Where do you love? I have found them at Wegman supermarkets this year and at Terrain, Anthropologie’s garden sister store. I am not certain if the bulbs will reflower as they are forced to perform in a timely manner. Hope this is helpful. Addressing your questions to the grower might be helpful. They do have a FB page as well. Can you provide a translation of your comment please? Thank you! Wow these are great…who knew? Thanks for giving us the link as I must order some of these for gifts…genius and Thanks much Johanne! They have been hard to find Teresa. Wegman’s supermarkets and Terrain(anthropologie’s garden store) have them in PA. The link is the grower and he told me he has been trying to get them into wider distribution. I hope you can find them as they are really extraordinary and fun. If you can’t and would like some I can see if our Wegman’s still has them and get them for you and ship them. Je crois que ces bulbes sont plutôt comme les bulbes de narcissus qui ont étés forcés pour fleurir à un temps précis. Ils ne refleurissent pas. Ceçi dit, il n’y a pas de mal à esseyer. Mais il faudrait retirer la cire et garder le bulbe en repos, sans terre, sans soleil, jusqu’à l’année suivante. 6 semaines avant de le faire fleurir, mettez le en terre et commencer à l’aroser et mettez le au soleil. Bonne chance! Please tell me how long do the plants last? I love them! I bought mine Nov. 5th2016 and two stems of flowers grew. They are now over, and it looks like the plant is slowly dying. Is that the way it is supposed to happen. I sure hope not. Thank you for the beautiful flowers. I bought one for my friend for Christmas!!!! Hi Barbara, If you cut off the 2 stems that have already flowered, you may get more growing but if the bulb is shriveling up, it may be spent. I would watch it for new growth for a week or so. Unfortunately these bulbs are forced for blooming and most are once and done. 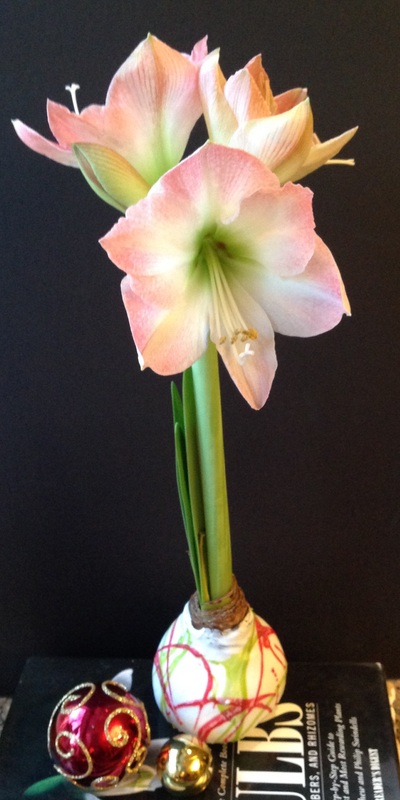 If you are good at getting regular amaryllis to rebloom, you could take the wax off and let the bulb go into dormancy, treating it like a regular amaryllis. When you are ready to force it again, you can pot it in a bit of soil like you would with a regular amaryllis bulb and start watering it. It might rebloom. Mine did not but a friend’s in California rebloomed in her backyard. Glad you enjoyed your bulb! They are so cool! Hello… I decided to look up this beautiful crazy NO MAINTENANCE odd thing I picked up at Xmas this year. It intrigued me so much when I saw it I just had to get it. Of course I can kill anything that grows so that very much interest me. about the …what now… as I see others were too. This is an old thread but I figured I would give my information anyway. ALDI. IT WAS $7.99 I believe. LIDL or ALDI in the future. Thank You for elaborating on this hidden gem !!! Wow! You had a spectacular specimen. So glad you had great success. I’m a big fan of Aldi’s as well but did not see these at mine in PA. They own Trader Joe’s as well and I have bought these bulbs at TJ. 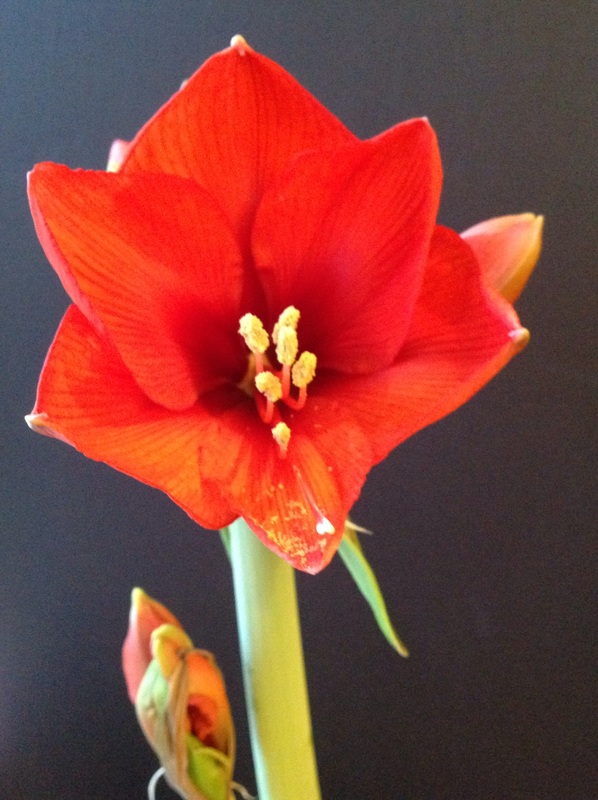 I’ve tried to get mine to rebloom in subsequent years by taking off the wax and treating it like any other amaryllis bulb(hibernation/chilling) and have had no rebloom, just foliage. You have nothing to lose by trying. A friend who lives in CA has her rebloom year round. Maybe you’ll be lucky! Most bulbs need to hibernate to make enough energy stores to rebloom so I think it’s a fluke to get a rebloom beyond the first year, probably from a super energy stored in the process used with these waxed bulbs.